The plant in Tampere was founded in 1942 as a manufacturer of buses and special bodies. The Ajokki name is translated as "vehicle". The factory was established in wartime, with all its attendant problems - shortage of materials and labor. Initially, production was carried out in rented areas. But in March-April 1943, production began in its own building. 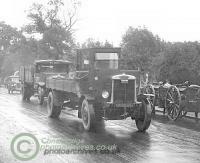 That time the company produced and repair trucks, chassis, buses and taxis. In wartime, almost all production went to army. In the late '40s production has increased significantly. In 1951, the company included 128 workers.